If you’ve already tried rapidly deploying WordPress websites to your hosting provider, you know how helpful one-click installation tools are, like the ones our hosting partner SiteGround offers. It has some cool features made in-house like an autoupdater that automatically backs up and upgrades your WordPress app. If you need a one-click installation, check out SiteGroundâ€™s options! Do you create and manage multiple Virtual Private Servers (VPS) with multiple WordPress sites on them for your company or your clients, or even for your own projects? 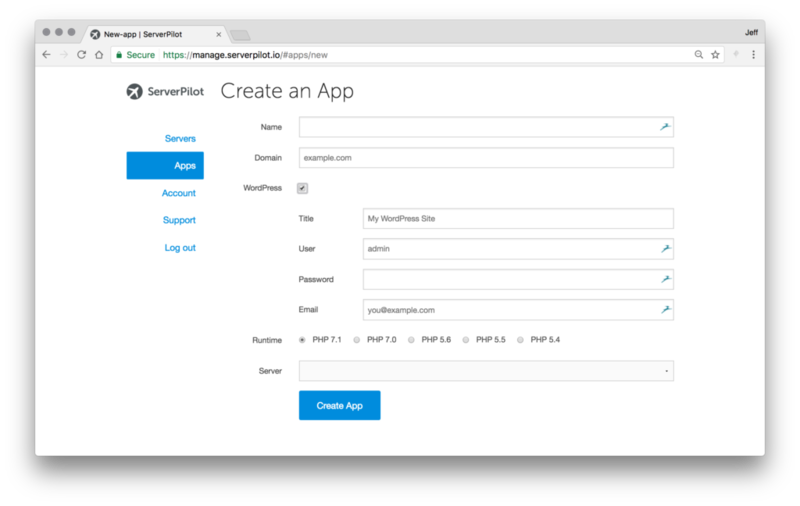 ServerPilot might be just the tool you need to manage those servers, and to quickly deploy WordPress to them. Anyone who manages multiple WordPress installations on various hosts â€” especially if you are a developer who also provides hosting services, whether for your own sites and projects, for clients, or even for your projects at work! The rapid nature of ServerPilot deployments eliminates a lot of the costly time issues involved with setting up your own web servers and deploying WordPress. 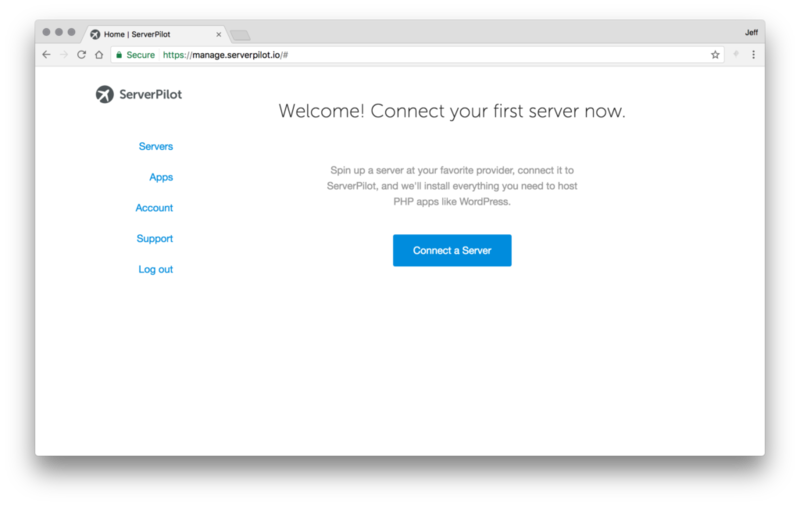 With some experience using a hosting service that provides VPS options, and with ServerPilot, you can spin up a new server and have a working WordPress installation on it in moments. 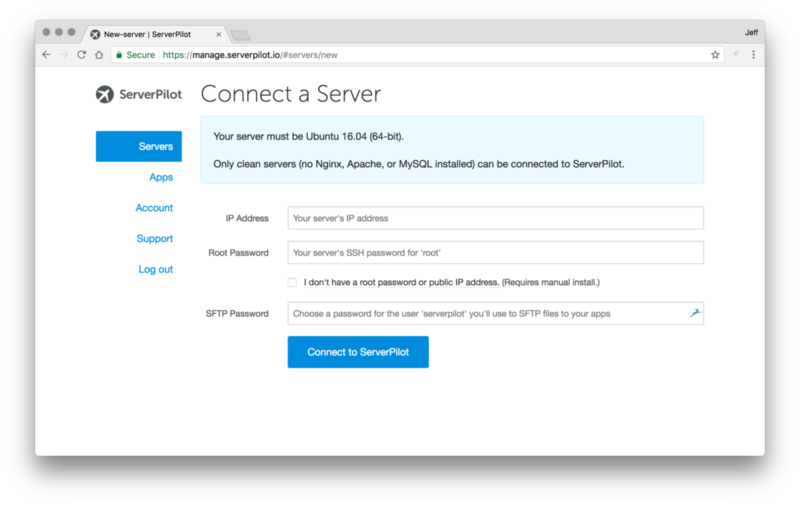 Setting up a server to be managed by ServerPilot is a simple process. Take a look below to follow along! Get an account with the hosting provider of your choice that offers Virtual Private Servers, and go ahead and purchase one. Some are monthly fees, others bill for hourly usage. Obviously you’ll be looking for what is best for your specific project. Get the root password, but don’t make any other changes to the server or set up any packages or applications. Leave the server “clean”, as ServerPilot would say. You’ll be brought to the welcome screen. Fill in your server’s IP, root password, and your desired password for the ‘serverpilot’ user that will be set up there. That’s that! If all has gone well, your server is now ready for you to begin creating apps on it. Here, you’ll enter the name you’d like to call the app internally, the domain that will be used to access it, the version of PHP you’d prefer to be used for this app, and finally select which server to install it on. The WordPress checkbox will open up further options â€” you can also set the site’s title, and the admin user’s username, password, and email. Then you just hit create app! Assuming you’ve gone to your registrar and pointed your domain name to your server’s IP, as you normally would, you’re done. You should be able to simply visit your URL and login to wp-admin to begin work on your site. There are a variety of management options and information available for your apps. Within the app’s settings, you can delete the app, set up managed SSL (with paid ServerPilot plans), add or remove domains that point to your app, and add or modify databases. You can also see some logs and statistics. If you are looking for a way to manage multiple virtual private servers, and deploy WordPress instances to them quickly, ServerPilot is an amazing resource. If you are instead just looking for a way to rapidly deploy WordPress to your hosting, and have no real need for a bigger management solution, many shared hosting providers have a one-click installation tool for WordPress that very well might suit your needs. Our partner, SiteGround, has such a tool, allowing you to deploy WordPress with a click. If that’s what you need, look no further! And if you need a more complex management solution – give ServerPilot a try, and let us know what you think in the comments.